Achilles tendonitis exercises which have proved most successful for chronic Achilles pain, are the Hakan Alfredson’s heel drop protocol, where the patient performs eccentric strengthening exercises daily for a 12 week period. Studies have been shown the Hakan Alfredson’s heel drop protocol to be the most effective treatment method for long-term chronic Achilles tendon pain in up to 90% of patients. However, the routine is tough and must be done daily for 12 weeks without fail. The patient is likely to suffer some discomfort and may feel their injury is getting worse before they see improvement. Eccentric exercises involve the patient dropping the heel to horizontal in a slow and controlled manner. An eccentric muscle contraction is one where the muscle gets longer as it contracts rather than shortening. With heel drop exercises it is the calf muscles at the back of the lower leg which are contracting at the same time as lengthening. Stretching exercises for the muscles at the back of the lower leg should also be done regularly. If the Achilles pain gets worse this is not necessarily a bad thing. It could just be part of the normal healing process. Heel drop exercises should be performed both with the leg straight and bent. A total of 180 repetitions should be done every day for 12 weeks. This is a lot more than most Achilles rehab programs would advocate. 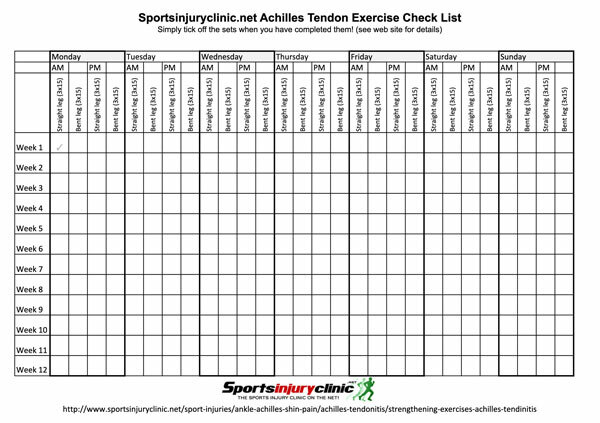 A 12-week record sheet detailed which exercises should be done when can be downloaded here. Achilles tendonitis heel drop exercises should be done both with the knee straight and bent to isolate the gastrocnemius and soleus muscles. The gastrocnemius is the larger muscle which originates from the femur (thigh bone) so needs to be stretched and strengthened with the knee straight. Bending the knee relaxes the gastrocnemius, leaving the soleus muscle to take more of the load. The patient begins by standing with one foot on a step and the heel raised up. Slowly lower the heel down keeping the leg straight until the foot is parallel to the ground but no further. The push up to the starting position using the uninjured leg to assist and repeat. Perform 3 x 15 repetitions twice a day. This is maintained every day for 12 weeks. The exercise should be moderately painful. Over time the pain in the Achilles may get worse before it gets better but as soon as 2 x 15 repetitions twice a day can be done pain-free, the load should be increased. This can be done by wearing a weighted vest or rucksack to increase the weight or load through the Achilles tendon. The patient stands with one leg on a step the as with the gastrocnemius heel drop except this time the knee of the leg being exercised is bent to 45 degrees. The heel is raised up high and then slowly lowered to the horizontal position but no further. Return to the starting position up on the toes with the heel high by using the uninjured leg. Perform 3 sets of 15 repetitions twice a day. Again, the exercise should be moderately painful and the pain may get worse before it gets better. Exercises should be continued until they are not painful then increase the load until moderate pain or discomfort is experienced once more. This routine should be done every day for 12 weeks. Why does Hakan Alfredson’s protocol work? If the two exercises are done strictly this should total 180 repetitions every day for 12 weeks. In the short term, exercise increases tendon volume and stimulates collagen production. The tensile strength of the tendon will increase over time making it more able to cope with the loads expected of it in day to day activities and sport. Eccentric exercise where the muscle gets longer as it contracts may be more beneficial than the usual concentric exercise because of the repeated stretching of the muscle-tendon unit. Eccentric exercises also allow for more force to be transmitted through the tendon. Achilles stretches don’t actually stretch the tendon much. It is all about stretching the calf muscles which feed into the tendon. Stretching is an important part of the treatment and rehabilitation of Achilles tendinitis. Tight or shortened calf muscles may increase the strain on the Achilles tendon making it work harder. Place the leg to be stretched behind and lean forward, ensuring the heel is kept in contact with the floor at all times. Hold the stretch for 20 to 30 seconds and repeat 3 times. This can be repeated several times a day and should not be painful. A stretch should be felt at the back of the lower leg. If not then move the back leg further back. A more advanced version of a calf stretch is to use a step and drop the heel down off it. To stretch the soleus muscle the back leg should be bent. Place the leg to be stretched behind and lean against a wall keeping the heel down. A stretch should be felt lower down nearer the ankle at the back of the leg. If this stretch is not felt then a more advanced version is to place the forefoot of the front leg against the wall with the heel on the floor and push the from knee towards the wall. This stretch can be performed to further the stretch on the calf muscles and Achilles. Stand on a step with the toes on the step and the heels off the back. Carefully lower the heels down below the level of the step until you feel a stretch – make sure you have something to hold on to! Hold for 15-20 seconds. This should be performed with the knee straight and then repeated with the knee bent to make sure you are stretching both muscles.